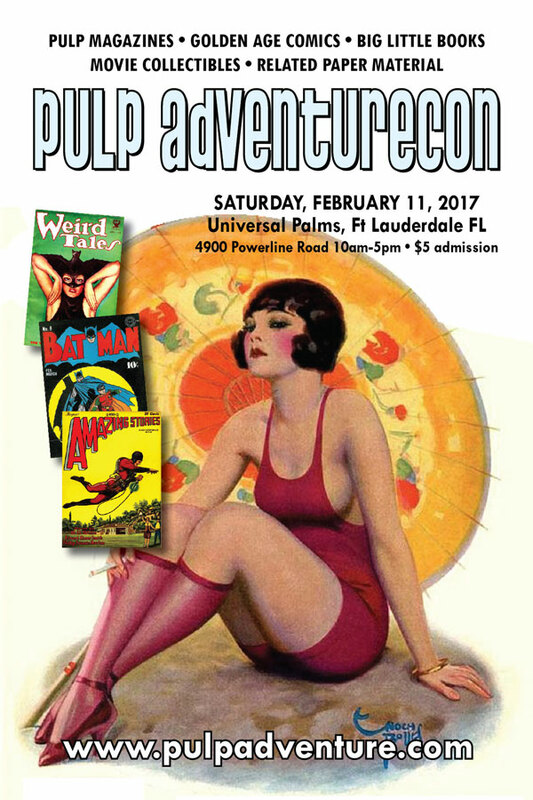 If you're a lover of gumshoe mysteries, pulp fantasies, or science fiction based odysseys, then I bet you a carton of smokes that you'd go bananas over Fort Lauderdale's top pulp inspired convention, Pulp AdventureCon, 2017. Bold Venture Press: Publisher of original works based on characters from popular pulp fiction. Mike Broder: Head honcho over at Florida Supercon Retro. Richard Meli: The founder of Heartwood Books. Jeffrey Shanks: Same as Richard, but for Skelos Books instead. Mark Maddox: Contemporary pulp artist. Plus many more great names will be added to the list shortly. 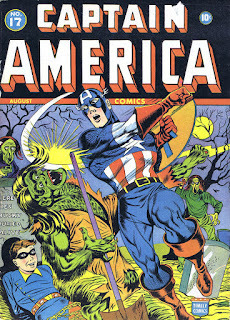 Another notable name attending the con is none other than the magnificent Golden Age illustrator, Allen Bellman. For those of you not in the know, back in the day Allen worked with Stan Lee in the office's of Timely Comics, under the supervision of Martin Goodman, a prolific publisher of comic books, pulp magazines, and many other periodicals. Goodman's pulp line-up included The Angel Detective, Ka-Zar, Marvel Science Stories (aka Marvel Tales), and Uncanny Tales. “I was born in Manhattan and studied at the High School of Industrial Arts", said Mister Bellman in an interview he gave quite recently. "I eventually became a staff artist at Timely during the Golden Age of comics. 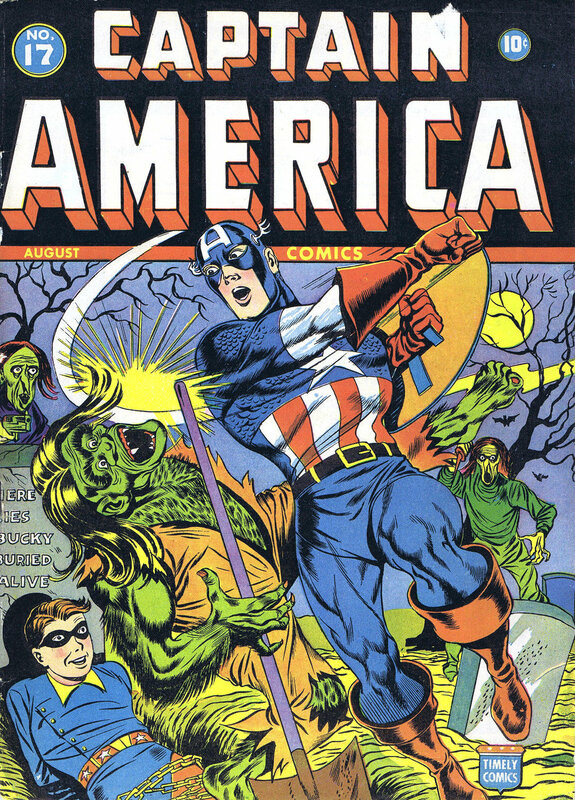 While still a teenager, I did the backgrounds for Syd Shores' Captain America, circa 1942, and I even worked on such titles as The Patriot, The Destroyer, The Human Torch, All Winners Comics, Marvel Mystery, Sub-Mariner Comics, Young Allies, and so many more". He also contributed to pre-Code horror, crime, war, and western tales for Atlas, plus he remained active in the comic's field well into the 1950s. So if you'd like to meet Allen, or any of the other illustrious guests, then I'd say this would be a great opportunity for you to come face-to-face with those people who helped forge the Golden Age of Comics. While there, please be certain to check out the great line-up of products on offer by the dealers. This ranges from pulp magazines, Golden Age comic books, to original artwork. You'll also find vintage paperbacks, men's adventure pulps, and quality reprints from various publishers. Where: Universal Palms Hotel & Conference Center, Fort Lauderdale, Florida, 4900 N Powerline Rd, FL 33309. When: The 11th of February, 2017. The doors open at 10am and close at 5pm. How Much: $5 for admission, and overnight guests will get a room rate of $109 per night, when they use the code word: PULP. 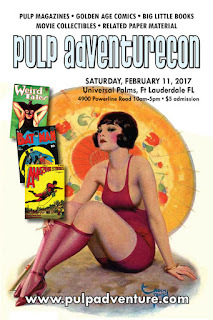 For any more information on Pulp AdventureCon, 2017, please feel free to check out their official website.